* This post and giveaway are sponsored by Family Fare Supermarkets. Opinions are all my own. I will be the first to admit that I have a love/hate relationship with grocery shopping. I hate making lists and spending time looking for healthy food that I can make into dinner for my family. I hate taking all four boys with me (which I have many times this summer) and refereeing their fights and telling them no to junk food and asking them to stop running into each other with the carts. I hate the whole process of putting the groceries in my cart and taking them out to scan and putting them back into the cart and putting them in my trunk and carrying them inside and then putting them away. GAH! I'm exhausted thinking about it. But, it's shopping, and I love shopping. When I get to go alone and I can wander down every aisle at my own pace, it's a total treat. When I have enough time to discover new foods my family might like - especially gluten free foods for Hubby - it's even kind of . . . fun. So, I jumped at the chance to attend the grand opening of one of eight newly remodeled Family Fare Supermarkets in the Omaha metro area. The stores were re-branded from No Frills and Bag ‘N Save supermarkets. I took Hubby and made it a date night! Unfortunately, we missed some of the festivities, but you can still partake in the fun through July 23. Grand re-opening events will include daily giveaways, food samples and surprise and delight offerings throughout the stores, with an emphasis on summer produce and local and living well products. Here's the exciting part: Store guests who shop with their Yes Rewards Card between July 20 and the end of August will automatically be entered into the Super Sweepstakes. 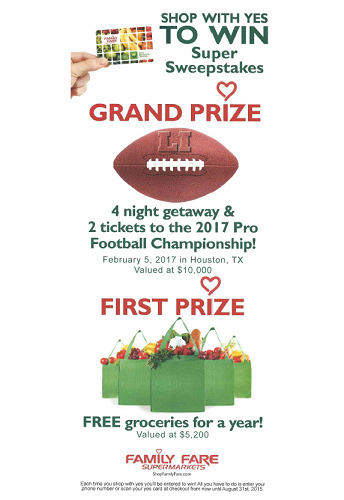 One lucky winner will win the grand prize, a four-night getaway and two tickets to the 2017 Pro Football Championship in Houston, Texas on February 5, 2017. Two first-prize winners will receive free groceries for a year! I have to admit that I am a pretty loyal shopper of another grocery store chain, but Hubby and I both found lots of reasons to go back to Family Fare. In addition to the low prices on many brands we regularly buy, we found amazing deals on organic produce, which is something that is important to us. Hubby also found many of his favorite gluten free brands and products. In fact, select Family Fare stores are introducing Living Well, a section within the stores that offers a better, healthier for you variety and selection dedicated to better eating and lifestyle choices. Living Well can be found near the produce department in every store with over 2,000 products in stock. Living Well choices include: Gluten Free, Allergen Free, Dairy Alternatives, Vegan, Organic, Non-GMO, Probiotics, Bulk Foods, Raw Foods, Superfoods, Cold-pressed juices and teas, vitamins and nutrition supplements, and health and beauty products. He was also impressed with the selection of deli meats available - all gluten, MSG, and filler-free. If you sign up for a Yes Rewards card, which is super easy and takes a few minutes, you can enjoy everyday savings, exclusive digital coupons, free and low cost prescriptions and savings on fuel. Plus, the more you use your yes card, the more personalized your shopping experience will be. For example, you can earn points toward gift cards every time you spend money on baby items or pet supplies. Family Fare is definitely worth checking out, especially with the grand opening celebration still going on at the above locations. 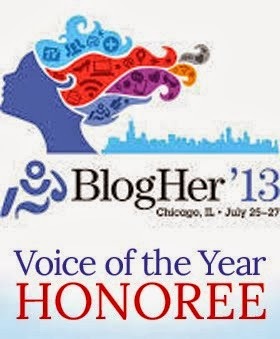 I'm teaming up with them to give away a $25 gift card. Check this list to see if there is a Family Fare near you. If you are a US resident and want $25 to go shopping with, comment below and tell me about your most and least favorite parts of grocery shopping. A winner will be chosen at random by Monday, August 1st by 11:00 pm Central time. Find Family Fare on Facebook, Twitter, and Pinterest for exciting events, savings, and recipes.